Being protected from the Haze is something which I take very seriously. The seasonal burning due to the slash and burn method that they use in farming in neighbouring Indonesia has caused the quality in Singapore to be seriously affected. 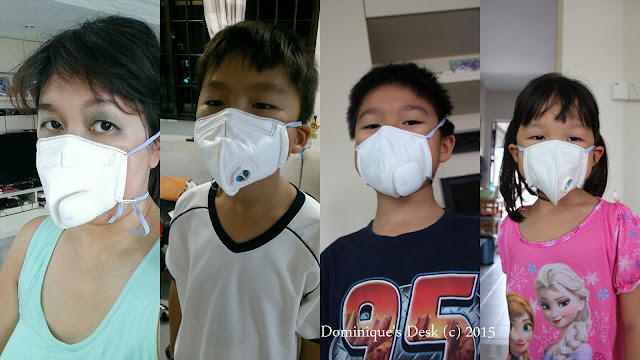 I remember back then in 2013 when the haze hit Singapore, everyone was scrambling for N95 masks as it was out of stock. I too was desperate to get a hold of the air mask for my family members and me as it was impossible for us to stay indoors all the time as we needed to get daily essentials like food and work still continued. It was a hassle looking for masks as many places did not have any ready stock. 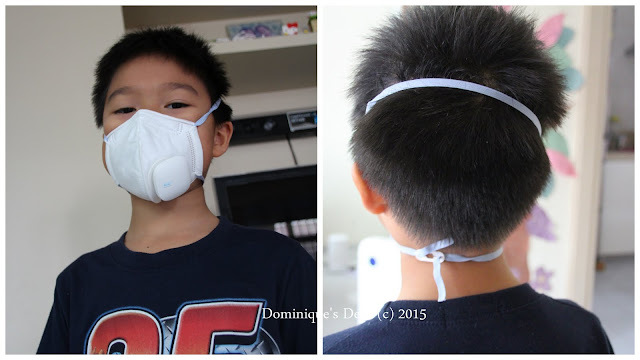 The largest gripe I had was that there weren’t any suitable mask for my kids back then. 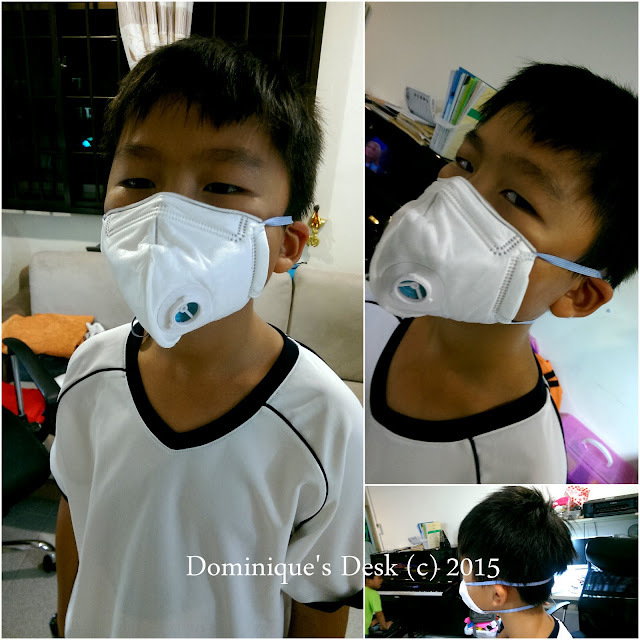 The existing masks sold only came in adult size and there weren’t any suitable for toddlers or young kids. This time around we are better equipped if the haze returns in full force . With the AIR+ Smart Mask on hand at home all my family members are fully protected as I have masks which can fit everyone at home. It is a system which is made up of a Smart Mask and a Micro Ventilator. The smart mask uses the latest cushion material to provide a snug fit on different facial profiles, ensuring a good fit. Smart Mask’s filter fabric is the latest innovation in filter mesh structure that helps you breathe with the least effort while attaining N95-class protection. 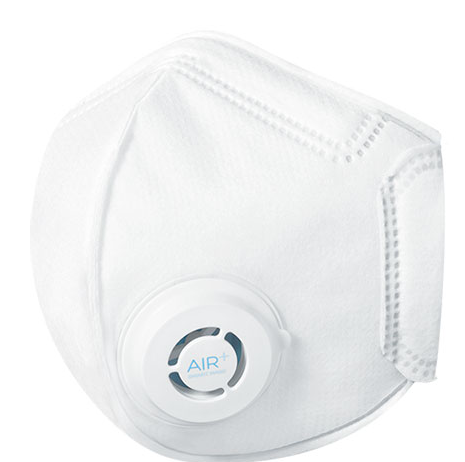 The Air+ Smart Mask with the Air+ Micro Ventilator attached. The Smart Mask feels very comfortable to touch. The fabric is soft and bends easily as compared with other existing N95 masks which are hard and have preformed shapes. 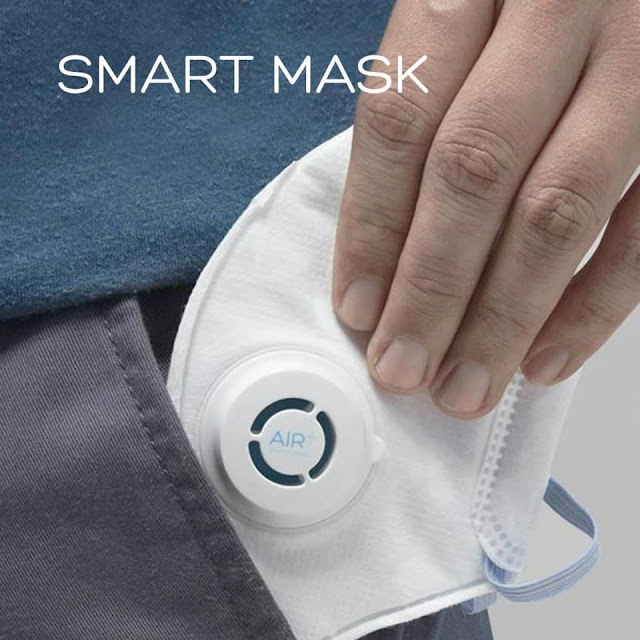 The Smart Masks are pocket size and you can slip it into your pocket to keep when you are indoors. This makes it very easy and convenient for the user to have the mask handy when going from one place to another. They are individually sealed ensuring that they stay clean before use. 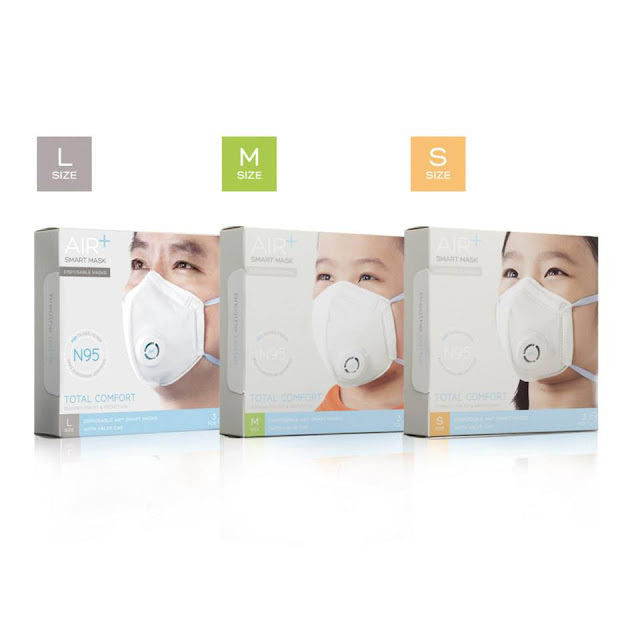 The Smart Mask is certified under the European Standards FFP1 to filter at least 80% of airborne particles, including oil based particles. The L Size is additionally certified as FFP2 and FFP3 to filter at least 94% and 99% of airborne particles, including oil based particles respectively. The AIR+ Smart Mask comes in a box of 3 and retails at $7.20 . Each mask in the box is individually sealed. There is a set of pictorial instructions on the inner cover of the box which clearly depicts how the mask can be used. There are also instructions on the individual mask packaging for the user to read through before usage. If reading the instructions seems mind boggling for you , you can watch the video embedded below instead. The AIR+ Smart Mask comes in three sizes. Small, Medium and Large to fit faces of different sizes. I tried the masks on the kids and they fitted really well. 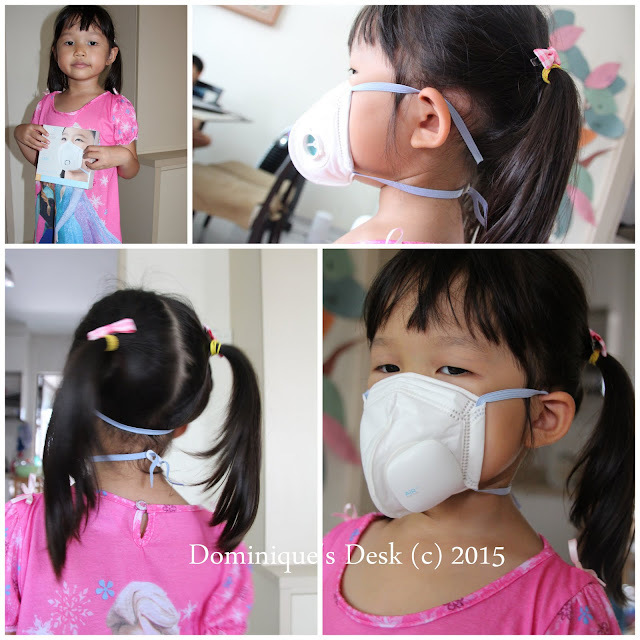 Even though the AIR+ Smart Mask is designed for children as young as 7 years old , The S Size mask fitted well on 4 year old Tiger girl. The adjustable bands at the back made it easy to ensure that it was the best fit for her. She could breathe comfortably in the mask and the bands were not overly tight and pulling on her skin. The next person to try on the AIR+ Smart Mask was Doggie boy. The S size mask was too small for him so I tried the M Size mask on him instead. It fitted him fine he happily model it for me. Using the measurement gauge on the product packaging and matching the distance from the eye to the bottom of the chin I found that the L Size AIR+ Smart Mask was a better fit for Monkey boy. You can see him comfortably wearing the mask in the collage above. 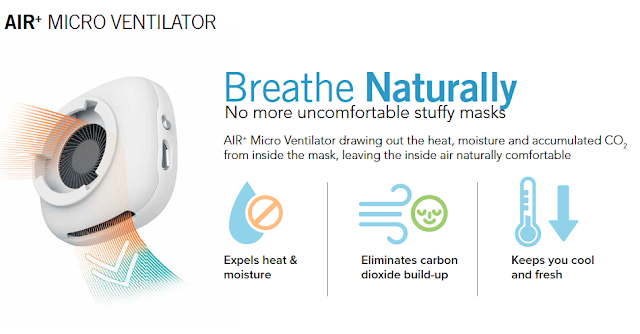 The AIR+ Smart Mask can be reused intermittently, up to a total of 8 hours and should be replaced when it is physically damaged or dirty or when you experience discomfort in breathing. AIR+ Smart Mask has a Valve Cap which should be used if you are not using the mask together with an AIR+ Micro Ventilator. The valve helps to regulate the air flow in and out of the mask making it easier to breathe. 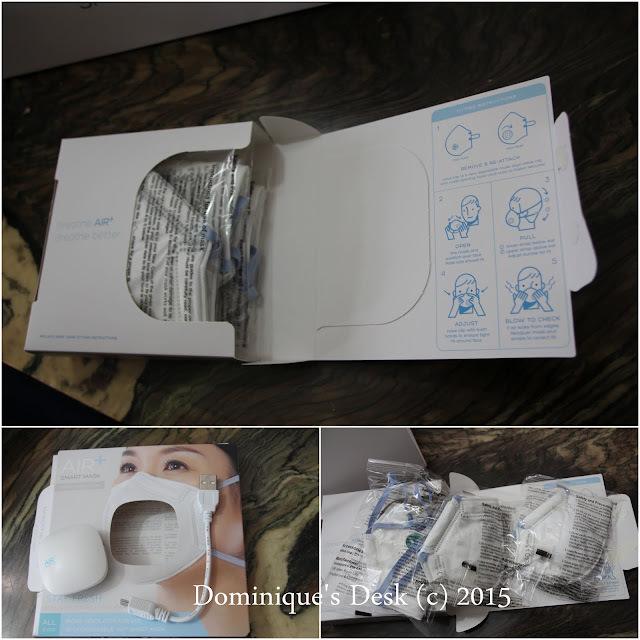 The Valve Cap can be found in the mask packaging box together with the Masks. 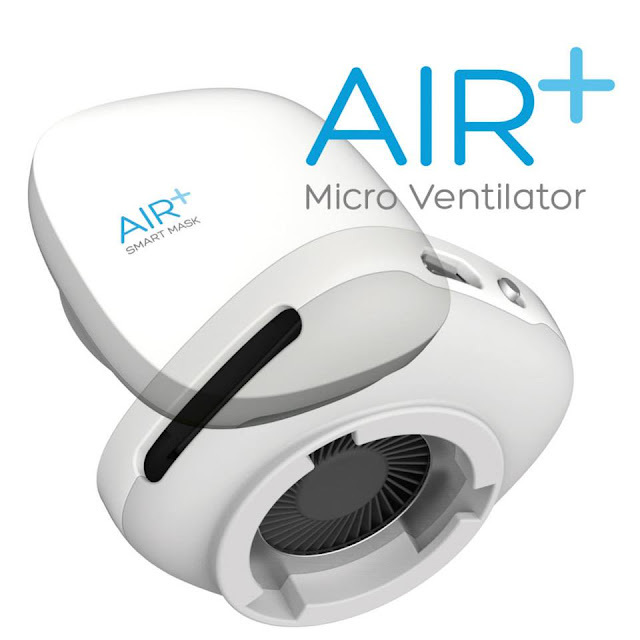 What is a Air + Micro Ventilator? The AIR+ Micro Ventilator extracts heat, moisture and accumulated Carbon Dioxide from the mask. This reduces the chance of the mask user from experiencing giddiness or headaches giving them a more comfortable user experience. Retailing at $29.90 this device which is powered by a built -in rechargable lithium- polymer battery can be charged using the USB cable which is provided in the box. 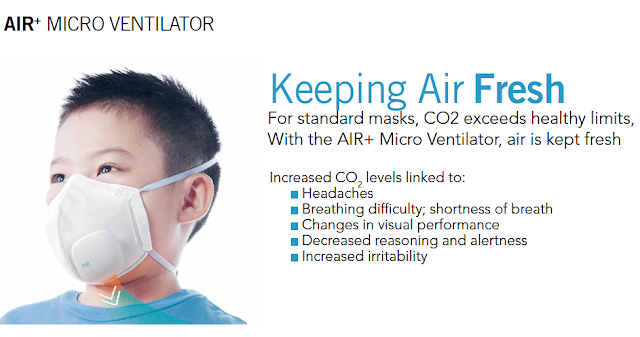 The AIR+ Micro Ventilator fits onto any size of the Smart Mask and can be used up to 2 hours continuously. It has a shelf life of up to 1000 battery hours ( or can be used 500 times on a 2 hours/ use basis). It is important to remove the exhaled carbon dioxide that builds up within the mask when one has a mask on. It is especially harmful for children to breath in recycled carbon dioxide as it can affect their well being and level of alertness. If too much carbon dioxide enters the blood stream there would be a chance of the child suffering from one or more of the following symptoms. -falling ill due to the lack of adequate oxygen within the blood stream. In severe cases it may lead to hypercapnia, low blood pressure and cardiac arrhythmia or nerve damage. This is certainly shocking news for a parent and something which I certainly would want to prevent at all cost if possible. 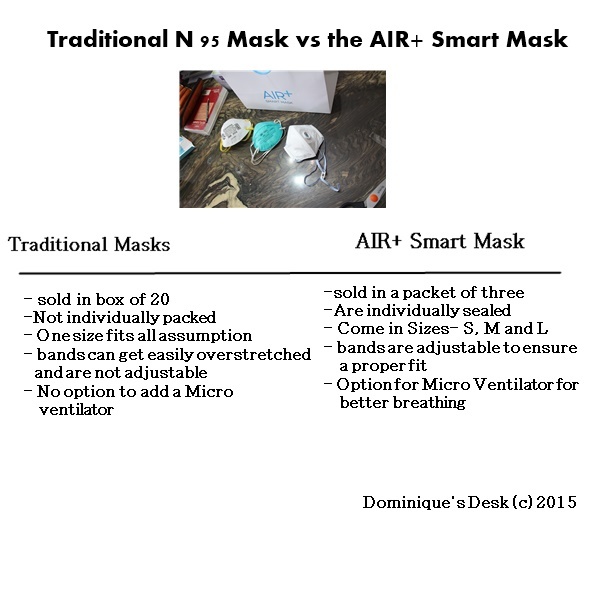 How does the AIR+ Smart Mask compare against the other Traditional N95 mask in the market? 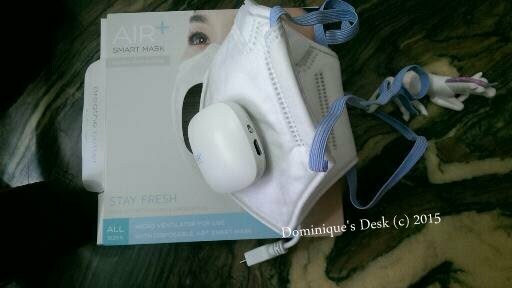 As you can see the AIR+ Smart Mask is more consumer friendly as compared to traditional N95 masks. I personally love the fact that the mask are individually sealed so that they are kept clean when not in use. Where can I buy the masks? 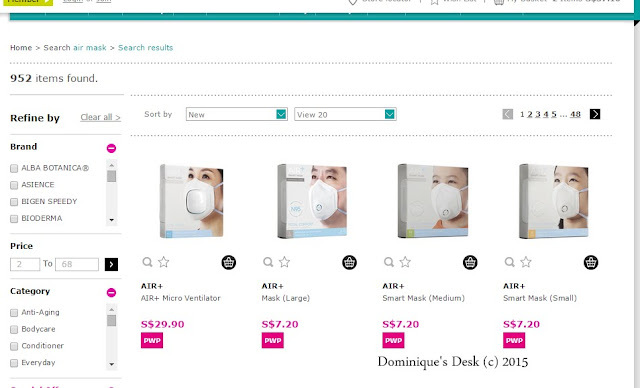 The AIR+ Smart Mask (3pc pack for $7.20) and AIR+ Micro Ventilator ( $29.90) can be bought from all Watsons Singapore and Watsons online store. I personally have ordered the product from the Watson online store and it delivered to my home within 2 days of placing my order. For more information on the product you can visit the website or facebook page. 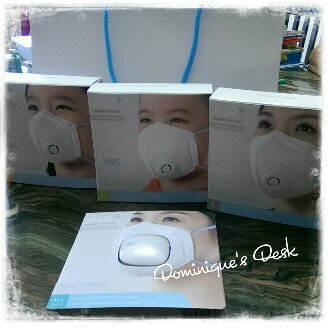 There will be an AIR+ Smart Mask Roadshow from the 20-21st June and Bedok Mall and on the 27th-28th June at Northpoint. Do come on down to see the Air + Smart Mask in action. 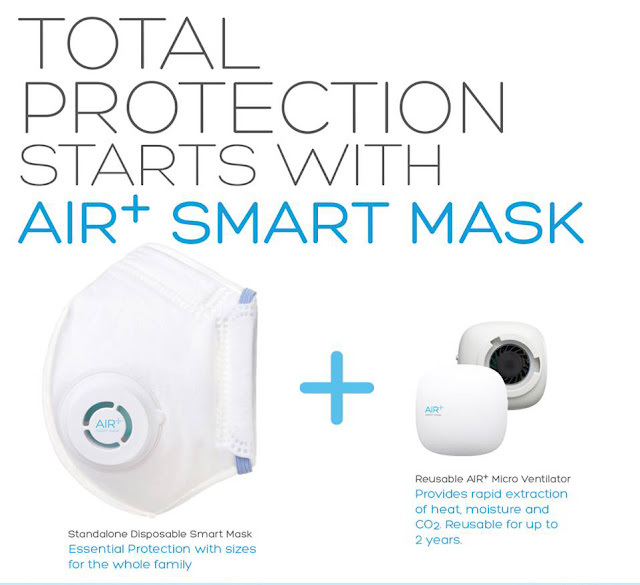 Disclaimer: This is an advertorial by AIR+ Smart Mask. All opinions are 100% my own.